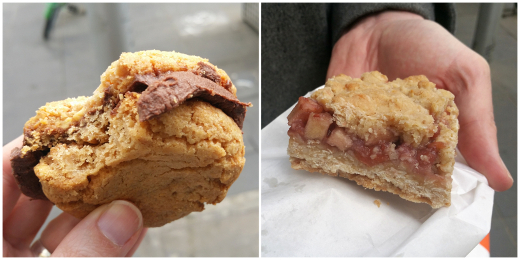 When we're in the mood for an all-day food project, we often turn to Serious Eats. 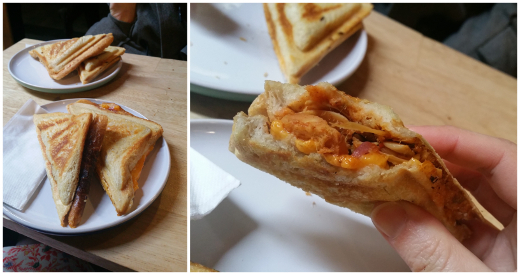 Most recently, we had a crack at their veganised Philly cheesesteak. We've never tried the real thing - a soft long roll filled with many layers of thinly sliced steak and some mild and melty cheese - but we've had a few mock meat versions around Melbourne before. What most appealed to me about this recipe is the use of layered bean curd sheets in place of the meat. We don't have a lot of experience cooking with it and I was keen to try it again. KFL Supermarket stocked numerous brands and forms, and we picked two to play around with. The first were just thin dried rectangles, and the second were thicker fried rings - I thought these latter ones might be a bit chewier and better at absorbing flavour. Each component is a full recipe in itself. First, there's a mushroomy stock where the veges are roasted for maximum flavour. You can optionally smoke the yuba, but we just added a few teaspoons of liquid smoke instead as we later cooked it in the stock. A vegan cheese sauce gets its creaminess from blended simmered potato as well as cashews; it's spiced up with paprika, chipotles and jalapenos. Then there's onions slowly caramelised on the stovetop and more roasted mushrooms for the filling. It really is an all-afternoon affair! 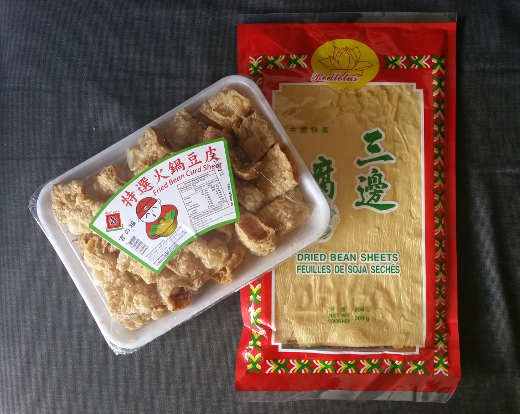 The one core hiccup for us was cooking the bean curd sheets. They're thin and brittle, difficult to slice into strips and and not amenable to being coated in dark caramel as the recipe suggests. Even once the stock went in, I picked and prodded at the bean curds, adding a bit more water and trying to make sure each one had enough time submerged in liquid to soften properly. I wonder if the ones used by the Serious Eats team had a different form. 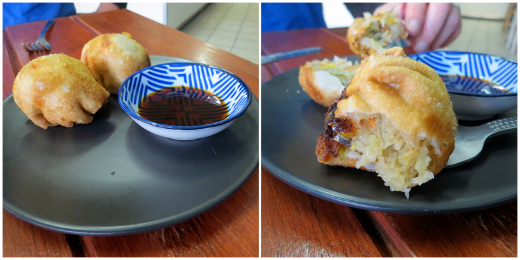 The finished rolls were sloppy and savoury and very enjoyable! And leftovers that we were glad to eat for days. But we didn't really pick up on the many nuanced ingredients that went in along the way - the stock was quite mild, the peppers barely perceptible, the mushrooms losing out to the volume of bean curd in the filling. Our minds are ticking over on a different version - less yuba (pre-soaked) and more mushrooms, sauteed in vegan Worcestershire and oyster sauces, and perhaps one of our other creamier vegan sauces. 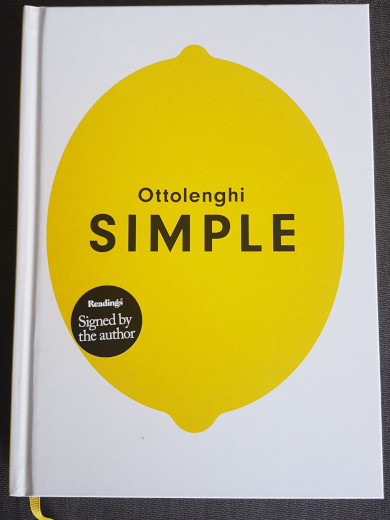 At this stage we're boldly hoping that we can quarter the effort and possibly even dial up the flavour along the way. Start with the mushroom stock! Preheat an oven to 230°C. In a large bowl, mix together the mushrooms, onion, garlic, carrot and celery. Add 4 tablespoons of the oil and the salt and toss everything together. Spread the veges out over two baking trays and roast them, tossing them around every 15 minutes, until they're dark brown, about 45 minutes total. Set a large saucepan over medium heat. Add the remaining tablespoon of oil and the tomato paste, cooking for up to 5 minutes, until dark brown. Add 1.5 litres of water, the roasted vegetables and the stock powder. Simmer everything together for 45 minutes. Strain out the solids and keep the stock for the following steps. Next, the cheese sauce. Pour the oil into a medium-large saucepan and set it over medium heat. Add the onion, garlic and jalapeño, and cook them, stirring regularly, until soft but not browned. Add the cumin, paprika, garlic powder and chipotle with sauce and cook for a further a minute. Add the potatoes and cashews, and cook for 2 minutes. Add the water and almond milk and bring it all to the boil. Turn down the heat and simmer until the potatoes are tender, about 10 minutes. Remove the sauce from the heat and add the hot sauce, pickle juice and salt. Use a blender or spice grinder to make the smoothest sauce you can (it's a tough ask with all those potato chunks!). Time to prepare the sandwich filling. In a small frypan, heat 3 tablespoons of oil over low-medium heat. Add the onions and cook slowly, stirring regularly, until thoroughly caramelised, about 30 minutes. Set aside. Get that oven back up to 230°C. In a bowl, toss the remaining 3 tablespoons of oil through the king oyster mushrooms and season it all with salt and pepper. Spread them over a baking tray and roast until golden brown, up to 20 minutes. Go back to your largest saucepan and set it over high heat. Add the sugar, and cook it until melted and browning. Add the yuba strips and, if you can, stir them around to get them coated in the caramel. Add the liquid smoke, paprika, garlic powder, and then pour over the mushroom stock. Simmer, stirring regularly, until most of the liquid has been absorbed by the yuba, about 15-20 minutes. (We added some extra water and put the lid of for a bit to get the yuba steaming, before taking it off to let liquid evaporate.) Turn off the heat and stir in the mustard. Fold through the sauteed onions and roasted king oyster mushrooms. To assemble, slice each long roll lengthways. Spread 1/4 cup of cheese sauce on the bottom half of each roll, pile up the yuba-mushroom filling and pop the top back on. We've been consistently enjoying lunches and brunches (and even one trivia night) at True North for a few years now. 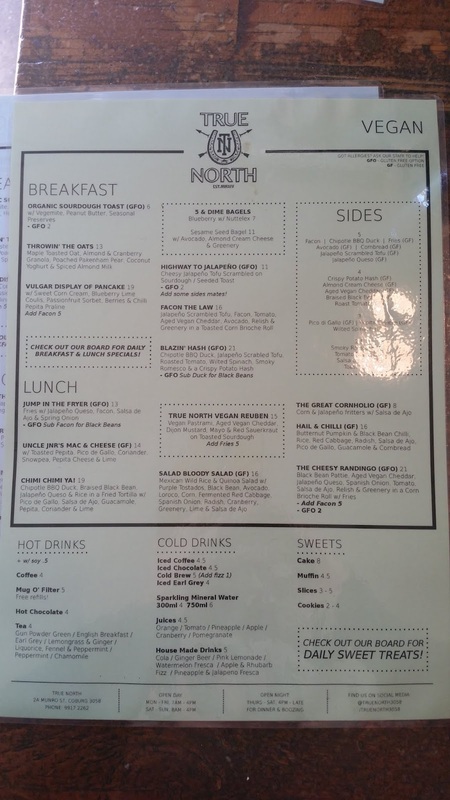 We stopped in for lunch last weekend on our way to the KFL supermarket, and loved the look of TN's current menu! There's an entire separate page of vegan stuff, with gluten free options marked throughout. It follows the same themes as we've seen before, loosely inspired by Mexican ingredients (jalapenos, black beans, pico de gallo) and diner staples (bagels, mac'n'cheese, potato hash) with mock meats and dairy scattered throughout. 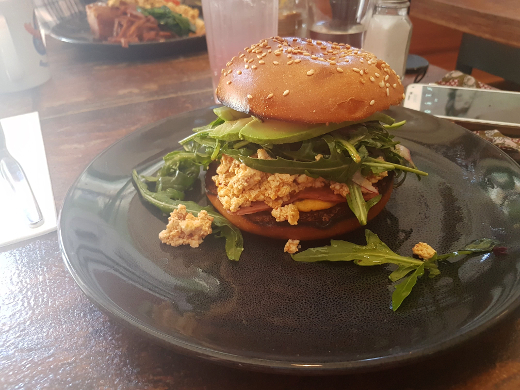 I surprisingly looked beyond the Vulgar Display of Pancake to the Facon the Law ($16), a toasted corn brioche roll stuffed with jalapeno scrambled tofu, facon, tomato, vegan cheddar, avocado, relish and rocket. It dripped juices everywhere, and the perfectly ripe avocado got a bit lost in the mix, but this was a mighty, squishy savoury joy. 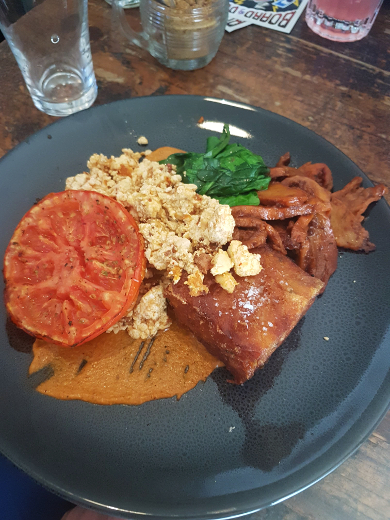 Michael was just as delighted by the Blazin' Hash ($21), a huge plate containing half a roasted tomato, more of that jalapeno scrambled tofu, wilted spinach, chiptole BBQ mock duck, and a golden-fried brick of the most exquisite potato hash. I also wanna tip my hat to the drinks menu, which includes some lovely non-alcoholic options that aren't kombucha. 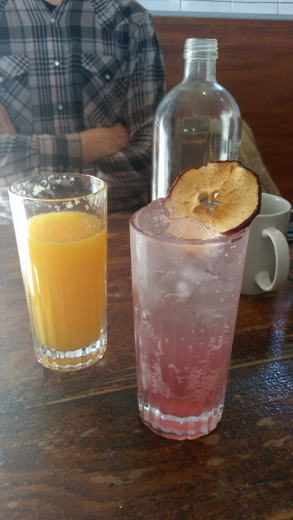 It seems these folks make their own soda syrups, including a charming apple & rhubarb fizz ($5). True North has achieved an impressive balance of still doing what it does best while also keeping the menu fresh. It means we're still bursting to blog it, even when our photos are overexposed and the cafe is four-to-five years past its instagrammable launch date. 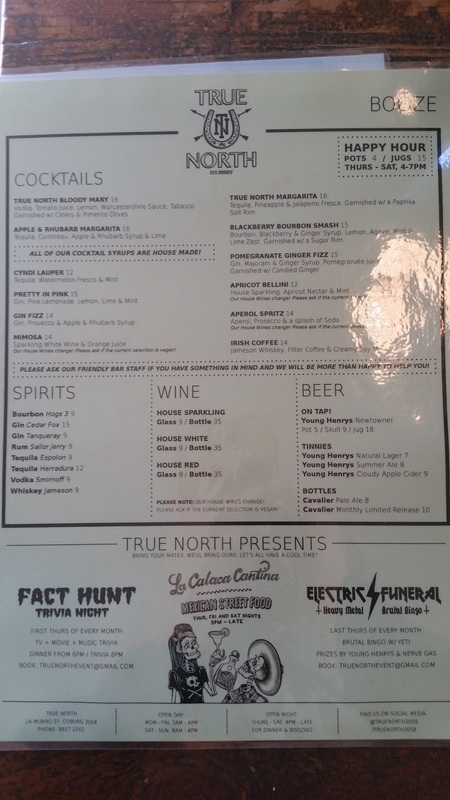 You can read about our previous visits to True North here and here. Since then it's received positive write-ups from little vegan bear, Veganopoulous and frenchtoastandindiepop. Accessibility: There's a small step on entry and a pretty crowded interior (especially on the weekends when the stools at the bar are in use). We ordered at the table and pay at a high counter. The toilet is a narrow non-gendered cubicle. Located on the edge of the University of Melbourne campus, I've passed Lanzhou Beef Noodle Bar and not paid any attention to it on countless walks and tram rides. But it unexpectedly turned up in our recent googlings of youpo mian, so we stopped in for an early low-fuss dinner after watching a movie at Nova. It was surprisingly tough to claim two seats at 5:30pm! As the eatery's name suggests, this isn't really a spot for vegos. The one-page menu starts with three beef noodle soups, two beef noodles, and a cold noodle plate featuring - would you believe it? - beef. Then there's the youpo noodle ($11.80), helpfully labelled as vegan in green lettering! There appear to be a couple other veg options too, though they're not labelled: the 'capsiegg' noodle with soybean paste and a selection of sides. I was determined not to order the lesser veg dish for a third time, so we doubled down on youpo. This one has the kudai/belt noodles we missed at Xi'an Famous! And there was no shortage of garlic and oil. I liked the chilli level, and there was more to hand at our table for Michael to dig into. In short, this had everything we've fondly recalled from the couple of youpo mian bowls we enjoyed in China! And all the more wonderful that we can revise the best noodle-pulling technique from the chefs while we wait. We didn't dare imagine that we'd be accessing these noodles again so easily in Melbourne, but Lanzhou Beef Noodle Bar also has outlets in the city and in Caulfield as well as Carlton. They really couldn't be more convenient. The only other blog review I've found is about the Caulfield outlet, on far fetched & fanciful. Accessibility: There's a shallow ramp on entry. Furniture is densely packed high tables with backless stools. We ordered and paid at a high counter. We didn't visit the toilets. This is a salad that we've been enjoying for several years, thanks to Smith & Daughters. It's been on a couple of versions of their dinner and brunch menu, and it's also in their cookbook. It's hearty and hardy and pickley and just a bit toasted, something that works both as a side and as a main dish on its own. The original version pairs artichoke hearts with Jerusalem artichokes; I've gotten lazy about the root vegetable and just use regular old potatoes instead. My two other convenient pantry swaps are dried thyme instead of fresh, and maple syrup instead of agave. This is the second or third time I've prepared it to share at a friend's house. It's usually tough enough to travel in its final serving state, but this one had a two and a half hour train journey between prep and presentation so I got finicky and packed many of the components separately. Rocket: in its own bag. Almonds: lightly roasted then jarred. Roasted potatoes and paprika chickpeas sharing one lunchbox, charred artichoke hearts and capers in another. Lemon-cumin dressing: jarred and ready for a last emulsifying shake before pouring. It was worth the effort to preserve all those textures, and the entire salad was happily demolished in a sitting, making the train trip home all the easier. Drain and rinse the chickpeas, then spread them out in a small-medium baking tray. Drizzle over the some olive oil, sprinkle in the paprika and add a little salt. Stir well and bake for 20-30 minutes (mine never really crisp up as promised). This is a good opportunity to toast the almonds in a separate small baking dish. There's no need for oil! Just keep an eye on them to avoid burning - they'll only take about 5 minutes. Scrub the potatoes and slice them into cubes, skin on. Place them in a large baking tray, drizzle them with olive oil, then add the thyme, plus some salt and pepper. Toss everything together, then bake the potatoes until tender, 30-40 minutes. After the almonds are out of the oven and cooling, There's probably enough time to make the dressing. Place all of the ingredients in a lidded glass jar and give them a thorough shake. Drain and lightly rinse the artichoke hearts, then slice them into quarters. Lightly dress them with olive oil, salt and pepper. Set a frypan on high heat and sear the artichokes on 1-2 sides. Remove the artichoke hearts. Drain the capers and pop them into the pan for just a minute, until they pop. 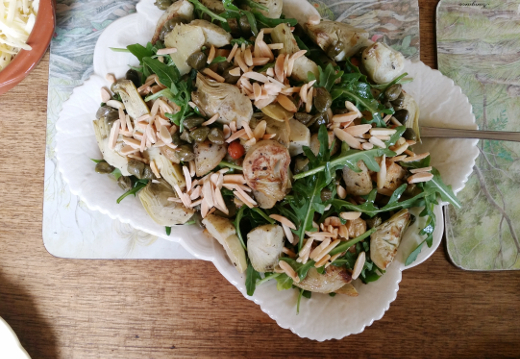 When it's time to serve, layer up the rocket, potatoes and chickpeas, artichokes and capers, then the almonds. Pour over the dressing and lightly toss everything together if you have the space. Last month Slate pushed an article into my RSS reader pronouncing Coke and Peanut Butter Sheet Cake Is Sweet, Salty and Southern. A sweet and salty dessert with an offbeat ingredient list? I was very predictably Into It. 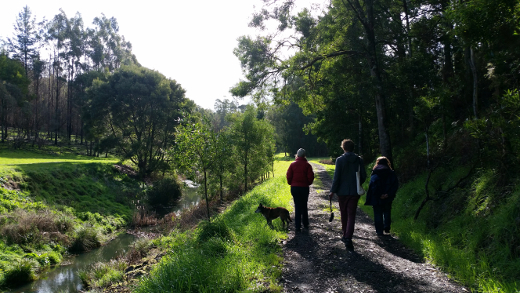 I found the right excuse to make it soon enough: we set off on a long weekend in Forrest with a couple of friends and I resolved to take most of the cake along with us, leaving a quarter of it back home with our cat sitter. This recipe is egg-free and pretty easy to veganise, so I went ahead and substituted Nuttelex for the original butter. This only goes a small way towards explaining the worrisome things I noticed as I proceeded. The cake batter was thick and a bit rubbery, and it barely stretched across the baking tray I'd chosen for it, even though this was smaller than the baking tray directed in the recipe. It never achieved the fluffiness of a fresh cake, and seemed to have two-day-old texture from the get-go. Yet, somehow, these two not-quite-right components came together to make a pretty great cake. The Coca Cola didn't offer a distinct flavour, but the thick buttercream countered the dryness of the cake and it was very satisfying to eat with a spoon. While this wasn't the novelty experience I hoped for, it was a comforting treat as we lounged by the fire with a jigsaw. Preheat an oven to 180°C. Line a very large baking tray with paper and spray it with oil. In a large saucepan, place together the cola, sugar, cocoa and margarine. Set it over medium heat and bring it to a high simmer, stirring occasionally. Turn off the heat when the margarine has melted and the sugar has dissolved. Set the saucepan aside to cool slightly. In a large bowl, sift together the flour, bicarb soda and salt. Pour in the still-warm cola and whisk until smooth. Pour the cake batter into the baking tray and bake until it passes the skewer test, 15-20 minutes. Allow the cake to cool before you ice it. Use an electric mixer to beat together the peanut butter and margarine. Gradually beat in the icing sugar, then the salt and vanilla. Add a little soy milk to loosen texture of the buttercream if needed. Beat for an extra 20 seconds after everything is well combined. Spread the buttercream over the cake. Sprinkle over the peanuts, and slice the cake to serve. 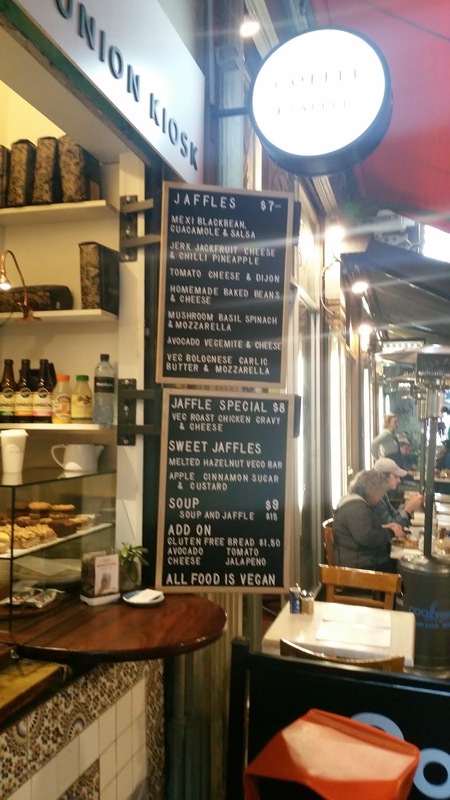 A few months back the veg*n telegraph pounced on the news that Northcote Fish & Chips were trialling a vegan menu, so when we were looking for a quick dinner in Northcote we headed straight there. The sign on the street promising vegan dim sims made it clear we were in the right place. 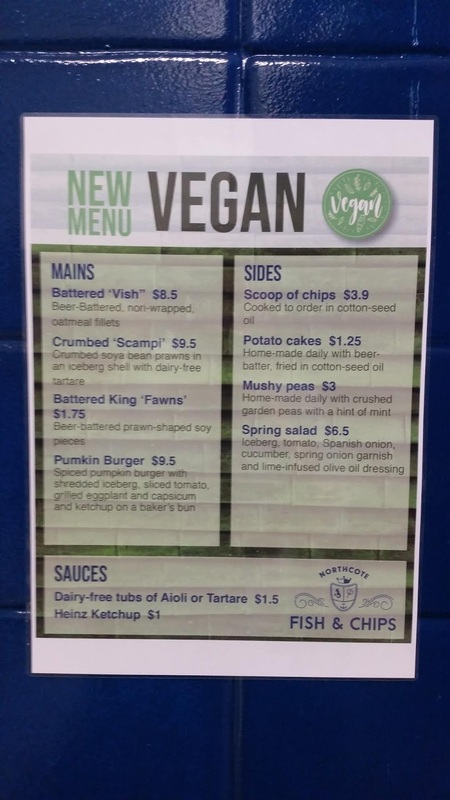 The vegan menu has mock prawns and scampi, a pumpkin burger, mushy peas, salad plus dim sims, fish, chips and potato cakes. We stuck with a a pretty classic fish and chip shop order - a couple of dim sims ($1 each from memory), a serve of the Vish ($8.5), a scoop of chips ($3.9) and a couple of potato cakes ($1.25 each). The dim sims were fine - I'm not hugely nostalgic for them, but they're nice fried little parcels of cabbage and other veggies, served with some soy sauce for dunking. The fish was the star of the show - an oatmeal and soy fillet, wrapped in nori and beer-battered. It absolutely delivers the fried fishy goodness you've been missing. Throw in some excellent crispy potato cakes and good chips and you've got the perfect mock fish meal. 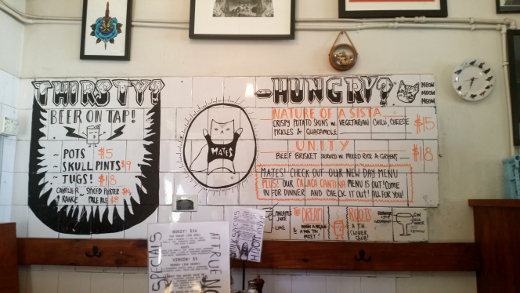 The guy who runs the joint is super friendly and it's very well located - this place is destined to become a Melbourne vego staple. The only other post we can find about Northcote Fish and Chip is Messy Veggies announcing the vegan range back in July. Accessibility: There's a flat but narrow entryway and a few well spaced tables inside. You order and pay at a low counter. We didn't visit the toilets. As we expounded upon our new love for youpo mian, Laura Jean McKay suggested that we give Melbourne's Xi'an Famous a go. 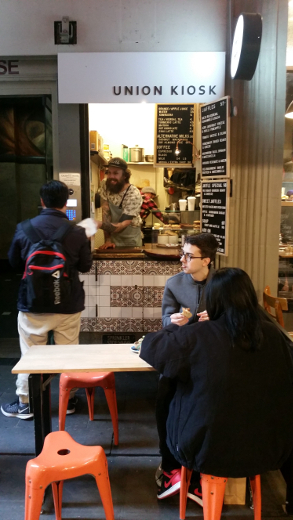 This mini-chain has outlets in the CBD, Carlton and Caulfield, and we figured the CBD one would be a convenient dinner stop before settling in for a MIFF movie. Online reviews warned us that this isn't a place for vegetarians, but we noticed a solid choice or two in each section of the menu: hot and cold rice or wheat noodles with chilli or sesame; a vegetable or egg burger; little fried pancakes and pies; vegetable dumplings; and cold dishes like chilli oil bean curd and shredded potato. But we were here to test out the big bowls of noodles! Ensuring we had some variation on the youpo mian, I ordered the tomato and egg noodle ($12.80). It was enormous, with a very mild and almost milky broth, plenty of tomato and egg fragments floating through, and a large submerged mass of noodles (the same as the ones below). The overall effect was a bit bland and soupy, and yet again I was jealous of Michael's superior order! He had, of course, the youpo mian - called spicy hot oil seared hand ripped noodles ($12.80) in English on the menu. The garlic-chilli dressing was exactly what we fondly recalled from our couple of bowls in China. I was again tentative about the chilli intensity, but it was well within my tolerance. The noodles, though, were a bit of a let-down: far from the wide flat belts we loved, these were more thick and slender and thus, much chewier. This eatery has a casual, help-yourself style; the staff confirmed with us what was vegetarian and were quick to turn around the food. While this wasn't quite the youpo mian we're yearning for, I'd gladly return to order it (and maybe some of the other fried things!) again. Accessibility: There's a small step on entry. Inside, furniture is a mixture of low tables with backed chairs and high tables with stools; they're densely arranged with a clear corridor through the middle (see photos above). We ordered and paid at a low counter. We didn't visit the toilets.